Kuwait embassy attestation services is required for all personal and commercial documents. Certificate attestation process has to be done according to the guidelines of Kuwait embassy. It is necessary for getting work permit in Kuwait or securing admission to the universities in Kuwait. Kuwait embassy attestation is necessary to legalize the documents submitted by you for employment or studies. Kuwait embassy certificate attestation is required for getting a work permit, for starting a business in Kuwait or for getting a business license in Kuwait. Without proper embassy attestation your application will be rejected. Kuwait embassy certificate attestation is necessary for getting your family/residence visa or for sponsoring your spouse. It is also mandatory for getting admissions in Kuwait schools and universities. HRD [Human Resources Department]: All educational documents are to be attested from the HRD of every concerned state. MEA [Ministry of External Affairs]:The second process is document attestation from the Ministry of External Affairs. 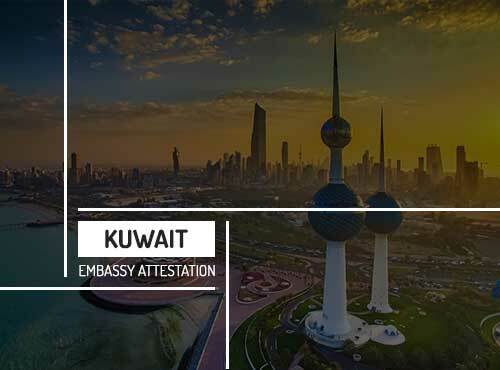 Embassy Attestation: In the third and final process, you need to submit the documents to the Kuwait embassy in your home country. MOFA Kuwait: The Ministry of Foreign Affairs of Kuwait verifies the document and attest the documents. It is always advisable to take the help of an expert when it comes to professional services. That is because professional experts know how to go forward with the procedure in the right way and know different ways to do the procedure because of their years of experience in the service field. Urogulf helps you to complete your embassy certificate attestation services in a quick and hassle-free way. You need not shoulder all the hardship of going through each and every place for document attestation process. Our experts will help you in getting your certificates attested in the most secure way within a limited time period. We ensure the safety of your documents and assure prompt delivery of the attested documents back to you after completing the entire process. We provide embassy certificate services for. Get in touch with our expert team in Kuwait office for any Kuwait embassy attestation services. We have a branch office each in Kuwait and other countries of the Middle East. Urogulf has offices in almost all major states and cities of India. The requirement of documents depends on the type of visa you are applying for. Visited during last month.The attitude of people and service mentality is excellent. Had a great experience..completed attestation for WES in committed tym..approach is very friendly and easy to communicate too.